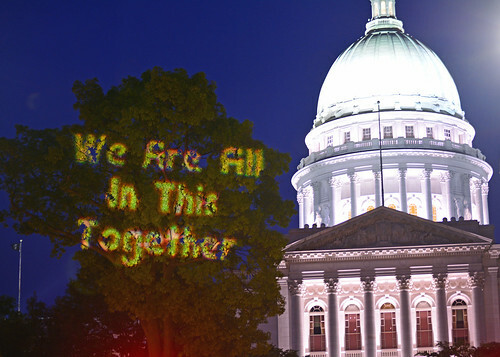 Members of the Madison, WI Solidarity Brigade projected imagery in solidarity with the Poor People's Campaign. Folks met on Capitol Square to draw some attention to the Poor People's Campaign. They came equipped with a spot projector with image slides provided by the Backbone Campaign. These images were projected in a couple locations an the set up was pretty simple but, they drew a fair amount of attention, and sparked some great conversations about the movement and OWR.